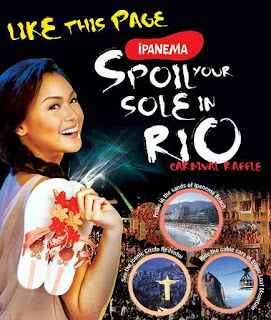 Ipanema Spoil Your Sole Promo ~ Philippine Freebies, Promos, Contests and MORE! Flip-flops with a prize? Possible! A purchase of any pair of Ipanema slippers (Ipanema or Ipanema Gisele Bundchen) from any participating stores nationwide gives you a promo code which you can use to join Ipanema Spoil Your Sole promo. Be a liker of Ipanema Philippines FB fanpage, register, and submit your promo code + name of store. Submit as many entries as you can for a chance of winning a trip for two (2) to see Rio de Janeiro Carnival, with hotel accommodation, tour around the city, food package, carnival tickets, and $1000 pocket money. Get to share this sweet prizes with a friend and spoil yourselves in Brazil, in VIP style. If you bought more than one (1) pair of Ipanema at one (1) time, just click 'Add entry' for another field for promo code and store. Round trip limousine services to and from the airport and during the parade days, both with an English speaking tour guide. $1000 pocket money or $500 per person.